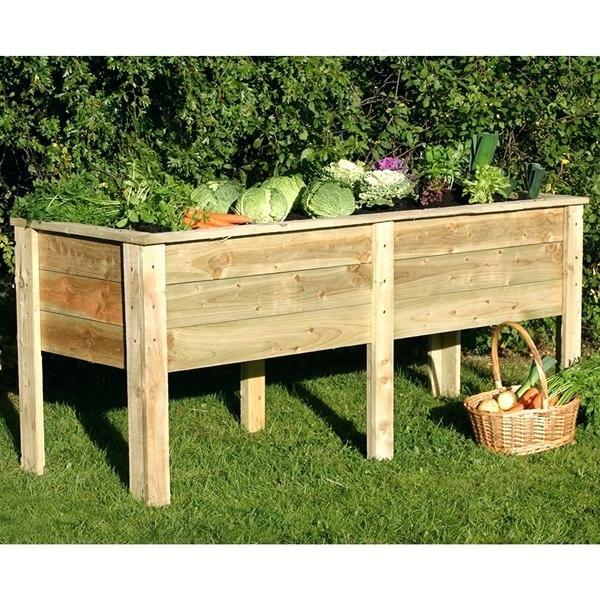 This smooth planed planter is a splendid timber planter that is great for growing garden produce. Made from high quality FSC* certified timber, it features a trough shape construction that will enable it to hold multiple plants, therefore saving you space, and has a generous depth that is ideal for plants with long roots. It is completed with sturdy legs that raise the trough for easy access and allow you to plant without having to risk bending your back. This grow planter has been manufactured from high quality, smooth planed timber that has been pressure treated in order to give it an extended lifespan, guaranteeing it protection against rot for up to 15 years. It has been built with a deep trough shape that can hold multiple plants at once and includes wooden legs that not only provide stability but also help raise the planter to hip height, reducing the risk of back strain when planting. *The Forest Stewardship Council (FSC) is an independent, non-profit organisation that promotes the responsible management of the world’s forests. Products carrying the FSC label are independently certified to assure consumers that they come from forests that are managed to meet the social, economic and ecological needs of present and future generations.